With cookies flying everywhere lately, I almost forgot to post this recipe for Honey Roasted Sweet Potatoes with Pomegranate Glaze. That would have been a shame because this dish, which I created a couple of months ago, has skyrocketed to the top of my go-to recipe list. Creamy, sweet, red-fleshed Garnet sweet potatoes are roasted until caramelized then drizzled with a tangy honey and pomegranate glaze. Then they're dotted with ruby red pomegranate arils, toasted walnuts, and savory thyme for a highly textured, flavorful, and aromatic side dish. Pomegranates are easy to find now due to their popularity at Christmas time. But don't delay, since their season usually runs from late October through January. I'm telling you, this is one side dish that can steal the show from an entree any night of the week. So, tell me, how do you use pomegranates in savory dishes? If you prefer, you could substitute 2 tablespoons of pomegranate molasses* for the glaze. Preheat the oven to 400 degrees F. Line a large baking dish or sheet with aluminum foil for easy clean up. In a large bowl toss diced potatoes with olive oil, honey, thyme, and salt and pepper, until well coated. Roast potatoes for 45-50 minutes, or until tender when pierced with a fork. Meanwhile, in a small saucepan over medium high heat, add pomegranate juice with honey or brown sugar; bring to a boil, then reduce until slightly thickened. Remove from heat. If you are using pomegranate molasses, then simply make sure it is at room temperature or warm before drizzling it over the potatoes. Place potatoes in a serving dish, drizzle with pomegranate glaze and lightly toss until well coated. Season to taste with salt and pepper. Sprinkle with toasted walnuts and pomegranate arils. *Pomegranate molasses (also called pomegranate syrup or paste) is a thick sweet and sour syrup used in many Middle Eastern recipes. It can be found in Middle Eastern specialty markets. Or you can make your own. Elise of Simply Recipes tells you how here. 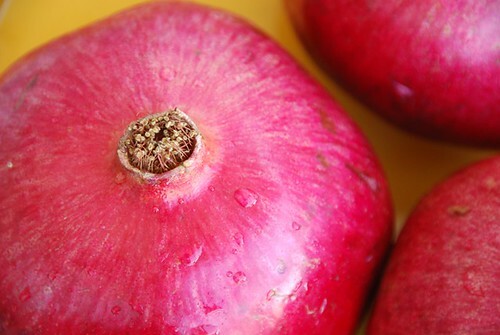 Looking for more pomegranate recipes? Then check out my latest Foodie View article, Impossibly Appealing Pomegranates, which includes over a dozen pomegranate recipes for everything from breakfast to appetizers to desserts. I have only had POMEGRANTE martinis! Looks fantastic! I've never used pomegranate molasses, but it sounds great. Looks simply delicious, and as usual... simply scrummy pictures too :) I just recently acquired some pom molasses. Hope your holidays were happy, and Happy New Year to you too! A delicious dish! What pretty colors! Unfortunately the only pomegranates I have found around now are imported (from USA) which is a shame because they do seem so festive but I did indulge in one before Christmas for a pumpkin pomegranate and orange salad with spiced walnuts! I love the look of your sweet potato dish and will bookmark it! I like how different the use of the pomegranates is. I feel like we always see the sweet potatoes and cinnamon combo. And it looks much lighter, like you could serve it at lunch. I've yet to use them in a savory dish...oh, but I did use a balsamic vinegar that was infused w/pomegranate...does that count? I must admit to being intimidated by pomegranates. I always savour them though when other great cooks use them in their dishes. Oh Susan, that pom glaze looks lovely! What an interesting flavor combination, and a tasty way to get your antioxidants in. 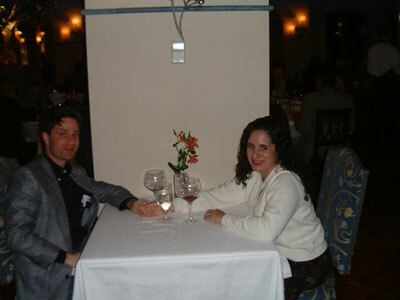 here’s wishing you and your family a wonderful 2009, dear susan. usually I make jelly o liquor with the pomegranates. this year I used them together with other fruit and coco falkes as filling in our Cristmas turkey. I love the idea og the pomegranate glaze..must try it! stacey-I have never had even ONE pom martini! I am not kidding! 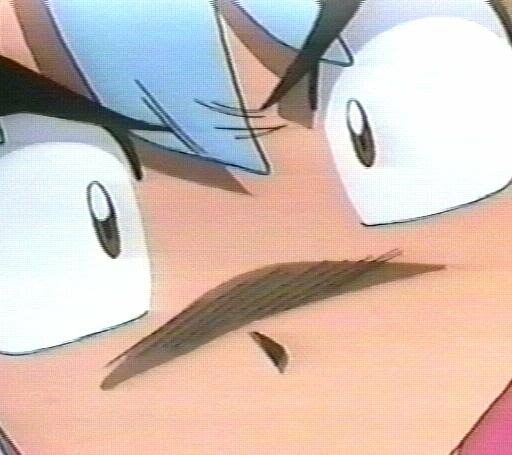 elra-Ooh, a glaze on duck sounds lovely. I've got to tell my mom about that one. Thanks! johanna-Ooh, that salad sounds divine. Thanks for sharing! ashley-It is a little different, so I'm glad it appeals to you. lauren- They are antioxidant rich! bee-Happy New Year, my friend! brii-Those are wonderful ideas. Thank you! Looks delicious and original - certainly not something I'd have thought of (but that's not a bad thing!). The photographs are great, too! I discovered pomegranate molasses a few years ago and now I use it everywhere! I especially like to use it in vinaigrettes. I'm fond of the arils anywhere you can think of--salads, with baked squash, in couscous, raw, oh damn am I hungry now! This looks like a satisfying and healthy dish - nice job and it looks pretty, too! Having eaten my share of cookies (and other treats) the last few weeks, right now I'd take a sweet potatoe over a cookie anyday! Oh my! Two of my favorite things in one dish. I love this one! Happy New Year! I have some homemade pomegranate molasses (a holiday gift from my cousin) that I'm going to use in some sort of tagine this week. Love using it with slow cooked chicken. The sweet potatoes look wonderful. I'm bookmarking to try soon. Happy new year, Susan. Love pomegranate in green salads, with lamb roast and in home-made chutney. Those date/pomegranate scones look really good. Have to try that! I have to admit I have never used pomegranates in a savory dish. I usually pluck them from my parents tree without the patience to save them long enough to cook with them. We just open them in a bucket of water and seed and eat them. Although I love Pom juice and can totally imagine how wonderful a glaze it would make! I love your use of it with the roasted sweet potatoes.. beautiful photo's and color too Susan! I hope you are having a wonderful Holiday season.. Ciao!! WARM WISHES FOR A PROSPEROUS & FOOD-FILLED NEW YEAR. I'm glad you posted this because it sounds so different! The colours are beautiful. You and I with the pomegranates! It's a pomegranate smackdown! Seriously tho it never occurred to me to use pomegranate as a glaze for sweet potatoes, but it sure as hell sounds like a brilliant idea. I'm on it! What a lovely dish! I'm getting inspired reading all your pomegranate posts. Happy New Year! Beautiful for New Years Eve or Day, well anyday! oh, perfect! I have a bag of sweet potatoes from Trader Joe's and a pomegranate on the counter ready to use. I am thinking this will go great with our ham dinner for New Year's Day! I don't have any pom juice on hand, but I do have a big bag of sweet potatoes that may just be the subject of those honey-roasted sweet potatoes today! Thanks for the recipe idea and Happy New Year! 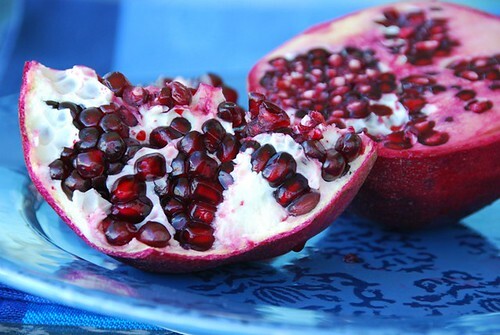 Your pomegranate picture is beautiful. I love the idea of a pomegranate glaze. Thanks for all the delicious inspiration your blog provides. Happy New Year, Susan! 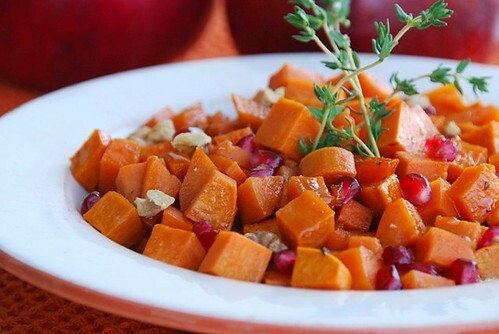 I love sweet potatoes, and I can only imagine how the flavor of pomegranate would take them to another level. Beautiful dish. Happy New Year Susan to you and your family. I can't say I've ever used pomegranates in savoury cooking, which is very remiss of me, isn't it? Must try harder in 2009! I made this last night. yummy! I love pomegranate molasses - it's a staple in our pantry since I learned of it from the Splendid Table a couple years back. I'd almost put it on anything. (It's great on ice cream, or a spoon for that matter) This recipe was delicious - I added onions too. thanks! tania-Thanks for letting me know! I'm so glad you enjoyed it. I'll have to try onions next time now. Thanks! Oh, that looks so lovely - both the colours and the flavours! I don't use pomegranates enough but do use them successfully in a rocket and fennel salad sometimes to add sweetness... and colour! This sounds like a fresh approach to cooking sweet potatoes :), I usually just cook them with apples, but pomegranates sound like a delicious alternative.